Sometimes I’m ashamed of myself. Grade school Royson once openly rooted for the boxer Sonny Liston to shut up the caustic Cassius Clay. And when Clay did what he predicted, whipped Liston and then changed his name to Muhammad Ali, and adopted the teachings of the Nation of Islam and the Black Muslims, I sided with the fools who refused to respect his choice. Clay was a perfectly good, respected, Jamaican-type name, I must have thought. Muhammad? Ali? What’s up with that? Black. Muslim? Fortunately, children are resilient. Entrenched self-hatred can be undone. Centuries of Eurocentric indoctrination can be unlearned, if not erased. We can emancipate ourselves from a system that leaves a child, obviously Black, three or four generations removed from West Africa, embracing everything but his ancestral culture. John F. Kennedy had been assassinated three months earlier. Bob Hayes was about to become the fastest man alive in winning the 100 metres at the Tokyo Olympics. Students were about to get their heads busted and bodies blasted by water propelled from fire hoses — for wanting to vote, or to order a sandwich at a lunch counter — and this magical boxer was giving voice to what sounded like heresies. Now I go to the African American Museum in Washington and am transfixed as I read and listen again to Ali — truly the greatest athlete of my life. It’s not fair, but I judge athletes by the Ali standard. Michael Jordan is the best basketball player I have ever seen, but LeBron James has him for dinner every time because James understands life beyond the playground. James’s social impact will endure after basketball records topple. Ali died in 2016, universally acclaimed. But in 1967 when he refused to be drafted into the U.S. army and was convicted, stripped of his title, sentenced to five years in prison (later overturned by the Supreme Court) and missed out on more than three years of fighting in his prime, he was reviled by many. But his words had found fertile ground. His activism led to Tommie Smith and John Carlos raising gloved fists on the Olympic podium in 1968 — an action that got them tossed from the Olympic Village but cemented them in my heart. So Colin Kaepernick? Love you, man. Even though you played for the enemy San Francisco 49ers. To take a knee, quietly and defiantly, making a statement against police brutality, was just lit. And when Donald Trump threw gasoline on the controversy, and fans burned your jersey, and the National Football League blackballed you and would not give you a job, I was again ashamed: of them, not of you; not of us. Undoubtedly, there are fans and people who are hurt by your protest. Some have not or refuse to listen and learn about the abiding hurt and pain that result from Black people’s daily interaction with the law. It’s their right to remain ignorant or to reject or dismiss or deny the experience of African people. This time I won’t be ashamed. I stand (take a knee) with Kap. 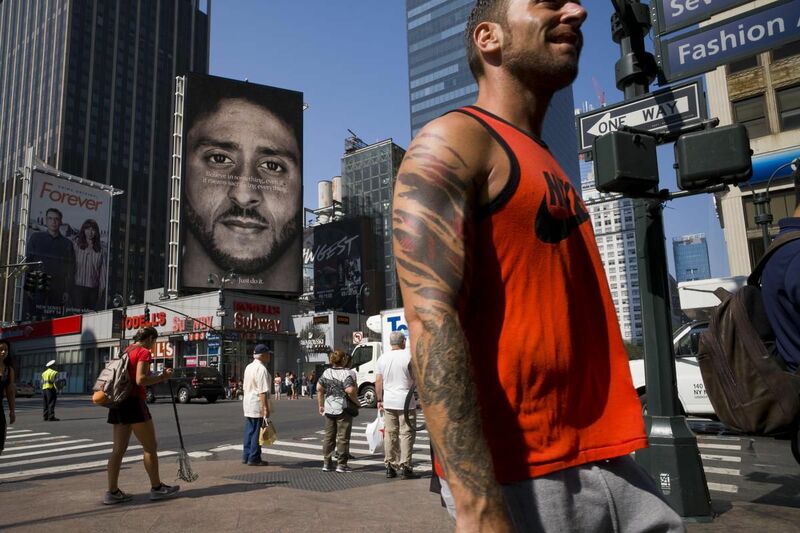 And when Nike announced that it was embracing Kaepernick as the face of its 30th anniversary ad campaign this year, even as the NFL continues to blacklist the player, I started looking for ways to support Nike; it’s my counter-contribution to those who will burn Nike apparel in protest. So I wore my Nike dri-fit Cowboys cap to my kids’ school Tuesday. I have two of them. When I arrived in Canada, I fell in love with this foreign game of football and picked the Cowboys because they had a familiar player, Bob Hayes, known universally as the Olympic 100-metre champion and the fastest man alive. To say I’ve been uneasy with the Cowboys is an understatement. In fact, uneasy with the NFL. In protest, last season, my fantasy football league that’s been going for a decade shut down and remains shut down this year because the league won’t play Kaepernick. Some have given up the NFL entirely. I watched only a few games. But now I’m done with the Cowboys after 50 years. The final straw with owner Jerry Jones, as Trumpian an owner as there is, was his threat to punish players who adopted the Kaepernick protest. And Cowboys quarterback Dak Prescott showed profound naiveté when he said football is a diversion that should not be sullied by protest and politics. “You wearing that hat?” a young teacher asked me Tuesday, pointing to my Cowboys cap. Felt ashamed again. So now, the caps are gone — even though they brandish the Nike swoosh. Nobody said this is easy. Or cut and dried. We act as we become aware and informed. The Alis and Kaepernicks of the sporting world sometimes give us a nudge. Isn't it time the wealthy paid fair taxes?